I'm Delia from deliacreates and I'm excited to share a fun, simple Halloween decor idea with you today. I was thinking about what I wanted to do differently this year for Halloween and thought it would be awesome to have spiders crawling all over our door. My husband is a little apprehensive about it. Ever since he saw Arachnophobia, he hasn't been the same. It's obviously not brain science. I just took some plastic spider rings from the dollar store. Cut off the ring part. Then stuck some magnets on with hot glue. The spider legs can get in the way of the magnet so you may need to tilt it upward and use a lot of hot glue, so that the magnet will fully stick to your metal surface. You don't want the magnet to bend or ripple at all. I started out using some advertisement magnets that come with the phone book. I have a white door so I just ripped off the colored tops to reveal the white paper underneath. Then cut them up. I quickly discovered that I needed fairly large pieces of this kind of magnet for this to work...darn cheap magnets. I have a tendency to save random stuff like magnets - you never know when you're going to need them. So, I found a stronger magnet strip that used to hold up a to do note pad in my stash. It worked perfect even when I cut it really small. Much better. I ended up with about 40-45 spiders so I had to use both kinds of magnets. Once you get them up you can't really see the larger magnets too much though. If your door isn't white you could always paint the business magnet the same color. What if you don't have a metal door? Put them on your fridge. They're magnets so you can change them daily if you want. Have them attack the door. Or come out in a trail. I think most spiders are solitary creatures so they are incredibly unlikely to come out in a line like this...but wouldn't it be creepy if they did? Ooooh. Thanks for having me over Allie. Love love love this simple and definitely spooky idea! The spiders behind the normal autumn wreath are my favorite. Subtle spooky. Yes! If you aren't a super Delia fan, then you should be. Go check out some of my favorite tutorials of hers: Braided Belt Tutorial, Mister Bow Tie Tutorial, Seamless Scarf, and the The Sharf (Shawl-Scarf). Bet you'll look up an hour later after clicking through those and many others and think, "Wait! What time is it?!" Thanks so much Delia! 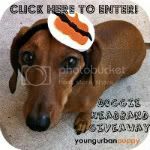 Go enter the giveaway for these precious doggie Headbands from Young Urban Puppy! Check back tomorrow for another great Halloween project from a Creepy Crafty Halloween guest! ack! I love this and I will be doing this!! I hate spiders, but I just might end up doing this. It's cute and simple and adds something fun. My boys would love it! cute cute cute. Love it! Pinning it! Wonderful fun idea! Thanks for sharing it. YoBit enables you to claim FREE COINS from over 100 distinct crypto-currencies, you complete a captcha once and claim as many as coins you want from the available offers.